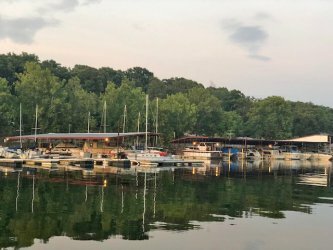 Tucked away on 30 acres in the hills east of Disney, Clearwater Bay Marina & RV Park is located at the back of Raper Hollow cove on Oklahoma’s Grand Lake O’ the Cherokees. The peaceful, secluded lakefront marina and RV park is the perfect place to get away from it all. 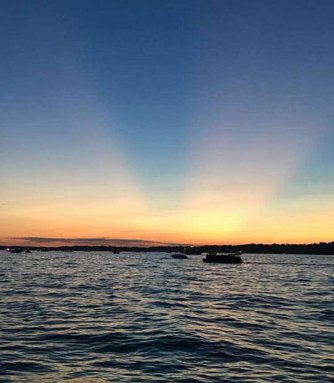 Whether you’re looking to stay all season or escape for the weekend, Clearwater Bay offers a quiet country setting on the shores of South Grand Lake. Owned and operated by Mike Whorton since 2006, the full-service marina and beautiful wooded RV park is a year-round facility known for its relaxed, casual atmosphere, outstanding customer service and easy access to Grand Lake. An expansion in early 2018 added 26 brand new sites to the RV park. All 80 RV sites at Clearwater Bay feature full-hookups with 30 and 50 amp electric service, water and sewer. Nestled among mature trees, the large shaded lots are easily accessible via gravel and paved roads. Clearwater Bay is both family-friendly and pet-friendly. Amenities available include wi-fi, nice and clean indoor showers and bathroom facilities and, best of all, lake access. The RV park is located within walking distance of our marina. Clearwater Bay has a private, lighted boat ramp and parking available for your truck and trailer. Clearwater Bay is a unique place to be. Our South Grand Lake location allows for the perfect peaceful getaway while also being close to all Grand Lake has to offer. We invite you to make Clearwater Bay your base of operations while you explore the area and discover all that is available, including shops, restaurants, state parks and local attractions, such as Picture in Scripture Amphitheater and the historic Pensacola Dam. We are also the only marina in the cove, so there’s less watercraft traffic and fewer wakes, making it a great location to raft up and party or just swim and relax. For those who want to take their boat out on the water, our location allows for straight, easy access to Grand Lake. We are in close proximity to the spillways. Once you pop out of our cove, the spillways are just to the left. A full-service marina, Clearwater Bay offers a wide array of services, including boat slips, boat repairs, boat sales, dry storage and valet service. The marina and RV park are monitored by 24-hour surveillance cameras. Clearwater Bay Marina & RV Park is located 3 1/2 miles east of the historic Pensacola Dam and 1/2 mile off State Highway 28. Give us a call or just stop by. We look forward to seeing you.